A giant carrot, an onion with tears, and florid head of lettuce stand like sentries at the gate of the Tenderloin People's Garden, at the corner of Larkin and McAllister. The faux veggies are painted in greens so vivid you can almost taste them. Eighteen wooden cutouts are sandwiched between the slats of the fence that encloses the garden. The cutouts are the handiwork of students from nearby Bessie Carmichael Elementary School, fruits of a three-month artist in residency program. 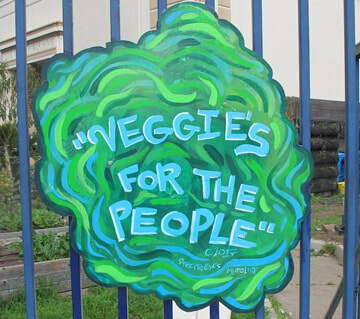 "Veggies for the People" employed paint and poetry to connect the 3rd and 4th graders to their community garden and neighborhood concerns about lack of access to healthy, affordable, fresh produce. The Tenderloin Neighborhood Development Corporation, located across from Civic Center Plaza, distributes the produce it grows to the residents. ​DRONE'S EYE VIEW of the "Growing Together" at the Tenderloin People's Garden. Drone footage by @Culturedvisualarts founder (Freeman) @trappedoutfreeeman captures "Growing Together" at the Tenderloin People's Garden from the sky. Precita Eyes partnered with the Yerba Buena Center for the Arts' artist-in-residence program at Bessie Carmichael over the course of 10 weeks. Master muralist Fred Alvarado mentored the students from rooms 207 and 208 in basic drawing, watercolor, and acrylic techniques. Addressing the students at the project's closing ceremony, "Mr. Fred" reminded them that the process of making art "teaches you to be creative in searching for solutions." The Oakland-based muralist works with youth at Richmond Arts and Contra Costa Community College, and is part of Precita Eyes' new Walls of Respect youth arts program. Students enjoyed the chance to express themselves in words and paint. Dan, a third-grade, not only composed and recited his Ode to Soup (below), he also took on the job of painting a cucumber nearly as big as he is. The exuberant forms and colors the students gave their art were inspired by a poetry workshop organized by 826 Valencia/The Writing Center. The Odes celebrate foods from soup to pineapples. The collected verses will be published in a chapbook for the students and their families. 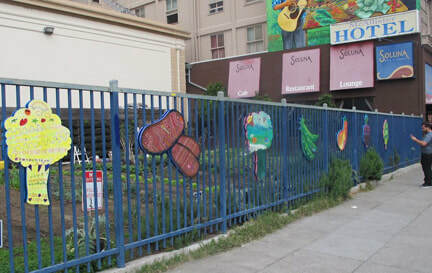 "Veggies for the People" combines arts education and community development in an inner city patch of San Francisco where affordable, fresh produce are hard to find. 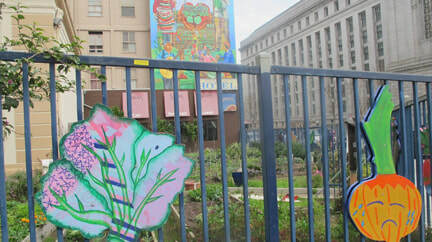 The installation connects local schoolchildren to the TNDC's healthy food projects and its advocacy of food justice. Located south of Market, Bessie Carmichael is the K-8 school closest to the Yerba Buena Center for the Arts, which supported the artist-in-residence program. The school's Filipino Education Center is one of the few city programs with instruction in Tagalog. In a celebration held at the YBCA (and not in the garden itself, as planned, due to heavy rain), students recited their food-themed verses to classmates, parents and well-wishers. Desiree Badong, here to chaperone and hear her daughter Kira read a poem, praised the arts program as a "therapeutic, helpful, wonderful outlet for children living in a neighborhood full of challenges." Gardener Alex Dazhan, who tends the Tenderloin garden, told students how the garden benefits local people by providing them access to healthy food. He encouraged them to bring their families to the garden, show off their artwork, and receive free produce. On Harvest Day, which takes place every other Wednesday, garden produce is distributed free-of-charge to community residents. 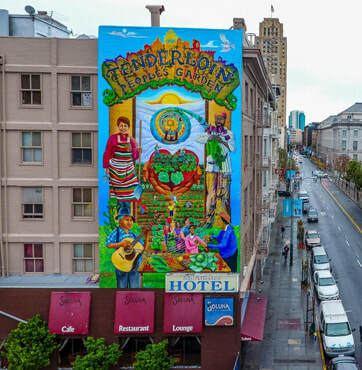 This project is a collaboration between the Yerba Buena Center for the Arts, Precita Eyes Muralists, the 826 Valencia Writing Project, the Tenderloin Development Neighborhood Corporation, and the Tenderloin People's Garden. BEHIND THE GARDEN FENCE: Winter harvest of edible greens and fantastical foods. IN THE SHOP: Artist-in-residence Fred Alvarado and Precita Eyes’ volunteer artists transform the student's visions into super-sized morsels. VEGGIES GUARD THE GARDEN, as the "Growing Together" mural looks on. Verses by Bessie Carmichael students are among the fruits of this garden project. 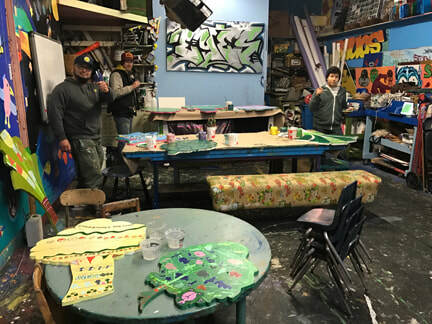 Three poetry sessions organized by 826 Valencia's Tenderloin Center introduced youngsters to the joys of "simile, exaggeration, personification, and the telling detail," says coordinator Jillian Wasick. The odes will be published in a chapbook for the students and their families. Spaghetti, you are as wiggly as an earthquake inside Jell-O. Spaghetti Sauce, you are as red as a fire truck. ..."
You are as pretty as a puppy..."
"Oh cucumbers, thanks for being my favorite color. You are health. You make me strong..."
"Oh Soup, thank you for your tastiness and kindness. with a pinch of non-spicy pepper. Soup, you make a call and say, "I am deeeeelish!"